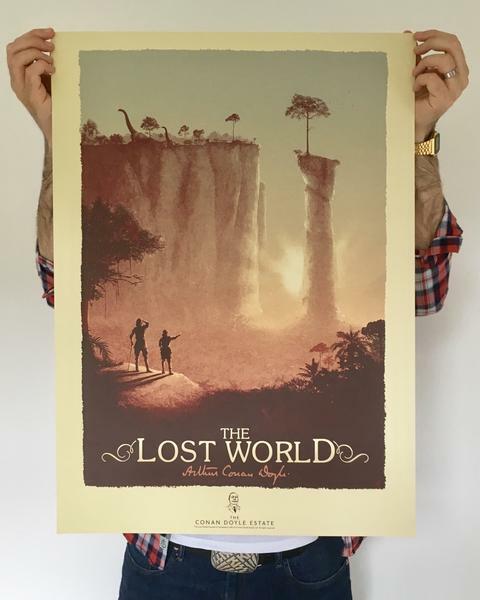 This was a passion project for artist and Vice Press co-founder Matt Ferguson who has wanted to interpret Conan Doyle’s forgotten world for a long time and with the support of The Conan Doyle Estate, we are all delighted to realise Matt’s vision with this gorgeous limited edition screen print. The screen print is no-longer available to buy and we are grateful to Vice Press and Matt for making these two prints available to us! To be in with a chance to win one of these beautiful screen prints head over to The Conan Doyle Estate's Facebook page or to our Twitter account. We want to know your favourite Arthur Conan Doyle character. Is it in fact Professor Challenger from The Lost World or do you love Rodney Stone or perhaps even Brigadier Gerard - are you a huge Sherlock Holmes fan - if so - tell us who your favourite is! Make sure you've liked our page, shared the post and have posted in the comment box the name of your favourite Conan Doyle character. If you'd like to tell us the reason for your choice - we'd love to know! Make sure you're following our page, retweet the pinned post at the top of our page and add the name of your favourite Conan Doyle character in the comment box. If you'd like to tell us the reason for your choice - we'd love to know! We'll be choosing the two winners at random on Friday 6th October 2017 and we'll announce the two winners on the same day. Good Luck! When we send your screen print we'll also include a signed letter from Arthur Conan Doyle's Great Nephew Richard Doyle, congratulating you on your win! Each print is printed on 100# French Cement Green by Lady Lazarus press. It is a 4 colour screen print measuring 50cm x 70cm. Each one is signed by Matt Ferguson and each is a numbered edition of 100.